Rid yourself and those around you from intrusive smoke particles and other unpleasant odors. 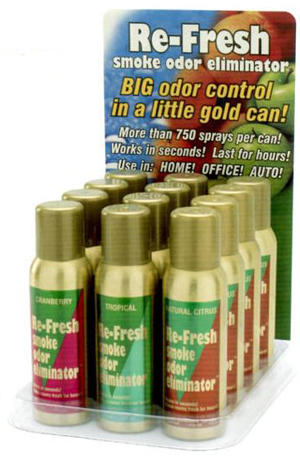 Re-Fresh Smoke Odor Eliminator does not cover up smoke, it eliminates it completely. So you can now freely smoke your chosen herbal blend without anyone smelling it or keep invasive smokers from leaving their scent lingering in your personal space. Re-Fresh Smoke Odor Eliminator has SE-500, a new patented ingredient that kills the smell caused by smoking within seconds. Each 4 oz can has more than 750 sprays. More importantly, since the formula is concentrated, each spray will keep your home, car or any environment around you fresh for hours. Various scientific measuring devices that detect the tiniest of odors proved that Re-Fresh Smoke Odor Eliminator cleans 98% of cigarette, cigar and any other herbal odors out of the air. You can also grab a variety of mixtures to Re-Fresh your life with multiple enjoyable fragrances. NOTE: Purchase is for (1) 4 fl oz. can of odor eliminator.